I seem to find more interest in cooking than eating out as of late. Polenta isn’t traditionally a food you would eat in Asia, and I was pretty surprised when I saw it in the local supermarket. I’ve never cooked with polenta, but I’ve eaten it enough times to know its not only delicious, but its a great ‘canvas’ ingredient, in the sense that its incredibly verstaile- you can cook it multiple ways, and the liquid you cook it in greatly influences the final product. Moreover, its incredibly easy and fast to cook, great for an afternoon snack. Leftovers? Throw them in the fridge to set, cut them up and sear them with high heat- Boom, polenta cakes. If theres a cure for cancer, I think it may be hidden somewhere in polenta. – Mix bacon into polenta, create a ‘hole’ in the center with the back of a spoon, and crack the poached egg in. Lightly season the egg with salt and pepper. Thoughts: The dish is simple enough that I’m not going to do a pros and cons list. I’ve done eggs sous vide from several temperatures ranging from 62.5C to 65C, and yes, every degree makes a huge difference when you’re poaching eggs. 65C yields an egg that has soft, smooth, velvety whites, and a yolk that doesn’t “flow” when you push your fork through it(it holds its shape, more or less), but is still incredibly creamy and moist. The creamy yolk goes well with the polenta, and is cooked enough that there is a perceptible difference in texture. The roasted garlic adds a tinge of sweetness and nuttiness to the polenta, and the bacon leaves a pleasant, never overpowering smoky flavour on the tongue, as well as a much needed crunch to an otherwise goopey dish(still delicious though). hi there! thanks for blogging this, i didn’t know local supermarkets carry polenta. may i know where you found it? if you sous vide your eggs at 65C for 75mins, you get a semi solid lumped up yolk that i think doesn’t go well with the whites. I think if you’re doing 65C, try 23mins, with eggs starting at room temperature. 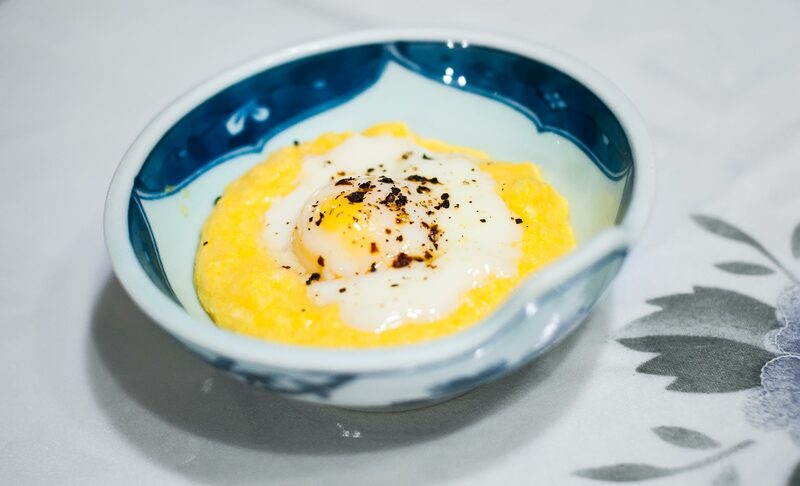 Use very fresh eggs, and you will get the Yakun-style egg (or what the japanese call the onsen egg), which has superb silky smooth yolk that eats well with the whites.